Accordion player and composer, Jonas Kocher studied a.o. with Teodoro Anzellotti, Pierre Sublet and Georges Aperghis. 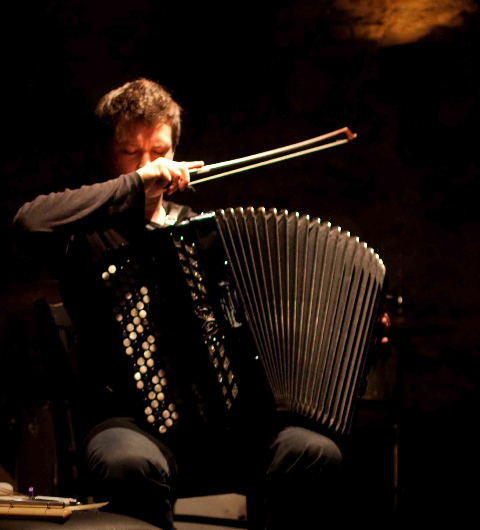 He collaborates regularly as accordionist in improvised and conceptual contexts with musicians such Michel Doneda, Christian Wolfarth, Olivier Toulemonde, Alfredo Costa Monteiro, Luca Venitucci, Burkhard Beins, duo Diatribes, Jacques Demierre, Christian Kesten, Gaudenz Badrutt, Chris Heenan, … . Jonas Kocher’s work explores the relationships between tone, noise and silence and the processus of listening. As composer he realises projects which are situated between composed theater, installation and concert pieces. His compositions has been played at Biennale Bern 2010, Theater Basel, Zentrum Paul Klee, Festival Encuentros Buenos Aires, KlangKunstBühne Berlin, Centre Dürrenmatt Neuchâtel, Festival Concentus Moravie, Zagreb Biennale. He composes also for hörspiel, dance and theater. Jonas Kocher is also involved as an organizer of different events in Switzerland.